Nautilus Pools are builders of quality concrete pools and spas in Noosa and on the Sunshine Coast. If you can imagine it, Nautilus Pools can design and build your new concrete pool or spa! Whether you want a formal elegant concrete pool or spa, a concrete plunge pool, spa or lap pool, something blended to your landscape, or an infinity pool overlooking the ocean or hinterland, Peter Byrne can design and build a concrete swimming pool to fit your specific requirements. Award winning Nautilus Pools has constructed many major resort pools in Cairns and is now firmly established in Noosa on the Sunshine Coast. 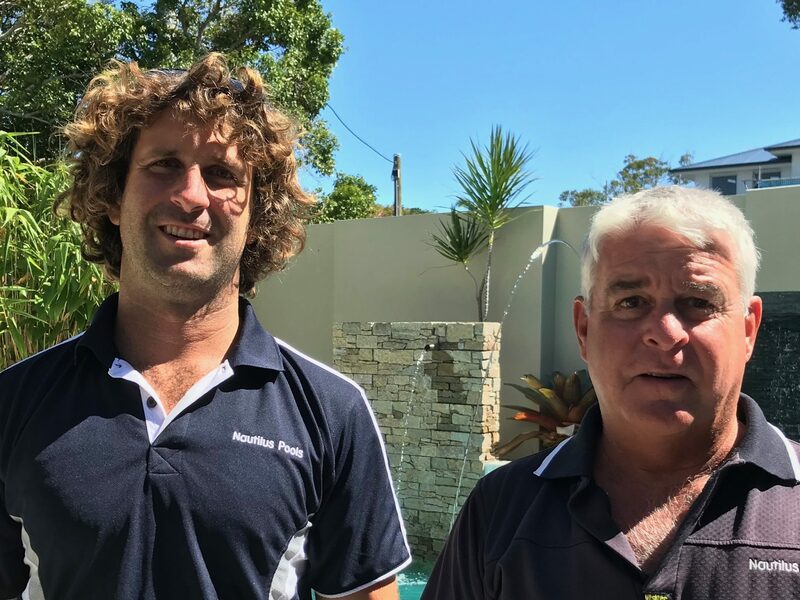 Nautilus Pools not only builds in Noosa but will also construct your new concrete pool anywhere on the Sunshine Coast, from Bribie Island to Maleny and Gympie and the occasional commercial pool in Brisbane. Peter and Linda Byrne have been designing and building swimming pools for many discerning clients for more than 34 years. Braden Byrne being born into the industry is taking the lead, supervising all projects personally. Since moving to Noosa in 2001 they have become many architects’ preferred swimming pool builder. Nautilus Pools is always keeping in touch with the latest range of water treatment systems, heating systems, pool controllers, pool cleaners, pool automation systems, pumps, filters, lighting and all new products and gadgets to upgrade your existing pool. Pool Lighting, pool heating and pool water features are always high on every new pool owner’s list and we can ensure you have the right options for your new pool, with cost effective heating and soothing sounds of gentle water falls. Turn your backyard into a tropical resort! Nautilus can also construct eco-friendly water saving pools also to suit the environmentally conscious. Nautilus Pools has been a SPASA member since 1997 and has won many Awards in different categories. Nautilus also has had many of its pools featured in Home Beautiful, House and Garden and Vogue. Call us today for a quote from an award winning and experienced pool builder on (07) 5449 2222 or send us an email at info@nautiluspools.com.au/manage.